The last week has kept me active a lot on some of the HF bands due to some great openings into South America as well as VK. I have noticed some interesting findings regarding the use of my Vertical Antennas and the home made full wave 20m Delta Loop, at different times during the day due to the ionospheres variable F layer. Up until this weekend the WX has been good with sunshine and pleasant conditions. The bands have definitely begun to improve especially at my QTH on most Evenings. During daytime conditions I have experimented around on 20m with a Mono Band ½ wave vertical and the Infamous Loop. With the second F layer seemingly being present at this time I have found the Vertical to perform noticeably better than the loop on 20m into Europe and the Middle East. But from 1800 UTC there is a sudden change of received angle of radiated signal and the Delta Loop is phenomenal and provides outstanding performance on RX and TX with no comparison from the Hustler 6btv or mono banded vertical antenna from all directions. This must be when the second F layer becomes unstable and allows signals to penetrate through, reaching the outer F layer with a different angle of radiation (Take off angle of signal from my antenna) which is more favourable to the Delta Loop as it seems?????. Here is some more about those elusive layers of the Ionosphere that we love to bounce our signals off of. Solar radiation, acting on the different compositions of the atmosphere with height, generates layers of ionization. The D layer is the innermost layer, 50 km to 90 km above the surface of the Earth. The E layer is the middle layer, 90 km to 120 km above the surface of the Earth. Sporadic E propagation is characterized by small clouds of intense ionization, which can support radio wave reflections from 25 – 225 MHz. Sporadic-E events may last for just a few minutes to several hours and make us radio amateurs very excited, as propagation paths which are generally unreachable, can open up. There are multiple causes of sporadic-E that are still being pursued by researchers. This propagation occurs most frequently during the summer months with major occurrences during the summer, and minor occurrences during the winter. During the summer, this mode is popular due to its high signal levels. The skip distances are generally around 1000km (620 miles). VHF TV and FM broadcast DX'ers also get excited as their signals can be bounced back to earth by Es. Distances for short hop events can be as close as 500 miles or up to 1,400 (or more) for a long, single hop. Double-hop reception over 2,000 miles is possible, too. Hopefully things will continue to improve and bands such as 12M, 10M, 6M, & 2M increase in activity with regular openings. The F layer, is 120 km to 400 km above the surface of the Earth. It is the top most layer of the ionosphere. The F region is the most important part of the ionosphere in terms of HF communications. The F layer combines into one layer at night, and in the presence of sunlight (during daytime), it divides into two layers, the F1 and F2. The F layers are responsible for most skywave propagation of radio waves, and are thickest and most reflective of radio on the side of the Earth facing the sun. I usually listen to the RSGB news on Sunday mornings 9.30 local time on 145.525 fm operating as GB2RS. The local broadcast covers information related to the Ham Radio hobby from solar forecasts, Dxpeditions, to local Events organized by Clubs etc. You can also catch other GB2RS News readers at various times on different bands during sunday, or via the HamInfoBar i player. If you like reading only, check out the RSGB site via the link on the right side of this page. I often find the solar forecast quite reliable as the recent sun spot activity reported was coincidental to the contact made into VK earlier last week. It is always amazing as well as exciting to be able to put a reasonably low powered signal into Countries at the opposite side of the world. Using simple home made delta loop antennas and the good old F layer with some freshly charged particles to Ionize and reflect! Last Night I battled with the sleep that was forming in my Eyes and stayed up late working a few Distant DX Stations that were coming through on 20m SSB. I worked Argentina first, LU2QC Osvaldo, with a 5/9 signal, followed by W1/GI0MPT Eamon, 5/9+ from south of Boston. 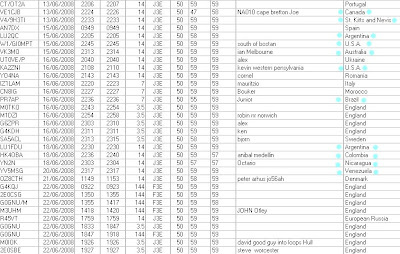 Just after that my luck continued and got even better with VK3MO Ian, at 11.11pm UTC (12.11 Local time BST) who gave me a 5/9 report on 14.177.30. USB using his awesome antenna array, 100 watts and I think Ian was running an Icom rig and was also 5/9. I used the good old ft767, 50w, with my full wave vertical home made delta loop to make both contacts.Whilst in RX, I compared the Loop to the Mono band vertical 20m ant, G5RV, and the Hustler. Sorry Guys the home made Delta loop(vertically configured) put them all to Shame with no comparison, in fact none of the other antennas came close to the Loop's performance. 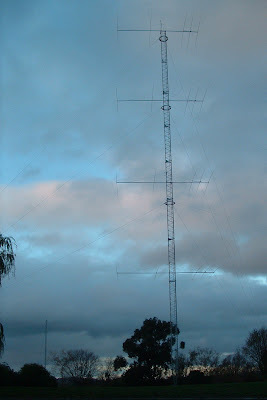 VK3MO, Ian is located in Melbourne Australia and he was a booming signal creating a nice little pile up, as you can see he runs an impressive antenna array so you should hear him fairly easily, where ever you are in the World. 73 and I hope to hear and work more nice DX signals to blog about in the near future. Just a quickie to share this great little tool for our Computers with those of you that like experimenting a little. I came across this useful addition to the Shack Computer and have found it to be a very useful and interesting tool for all Radio enthusiasts. 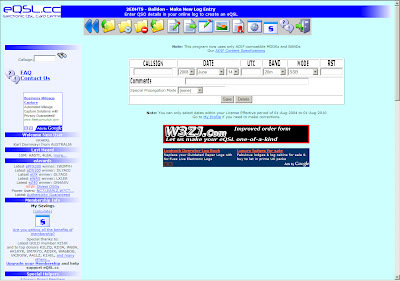 The Tool bar doesn't seem to cause any conflicts and offers a wide range of Ham radio and radio related content. It is neat to look at and simple to explore, there are many useful and innovative features, too many too mention. 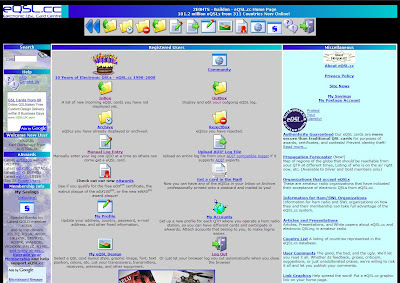 So far I have come across cool things such as links whilst browsing, these have taken me to some interesting up to date Ham Radio Information. Feeds, Propagation Forecasts, DX Clusters, DXpeditions for LF, HF, VHF, UHF and everything else that Ham Radio is involved with, including techy stuff. Have a look yourself and I can honestly say I was nicely surprised with the Tool bars gadgets and features. Registration is simple enough and doesn’t take too long. I have many outstanding eQSL cards sent to far away DXCC that are still in the system waiting for the particular Stations to join eQSL. The good thing is when a new member returns your eQSL maybe 2 years later, as the card’s you send remain in the system until they are claimed by the recipient. eQSL is free to send and receive cards and for a small donation you can upload your own graphics/designs. 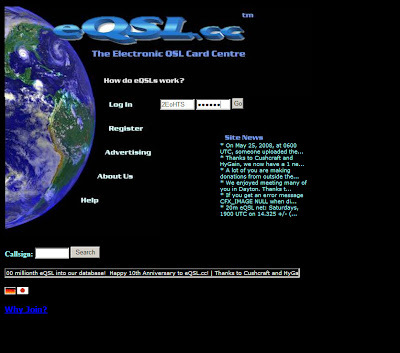 There are simple step by step instructions helping you design your own QSL card as well as other interesting Ham related stuff on the eQSL web site. 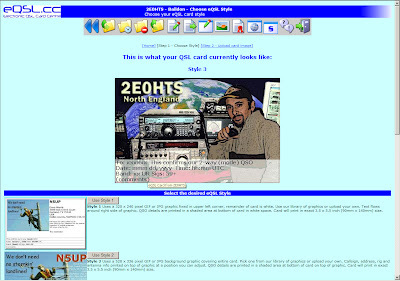 I hope those of you who dont use eQSL already, found this useful. Watch to see how I spent my Sunday afternoon making a simple full wave 2 meter Delta Loop and then make a 200 mile QSO with MM0GPZ/P in Scotland on 144.285 usb. Tonight I had the pleasure of working Tomas OK4BX who regularly shares information here on Hamradio.blogspot. 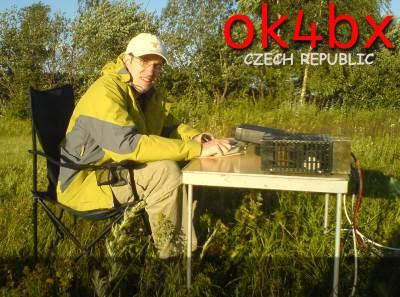 Tomas came through 5/8 on 40m (7.093 LSB)at around 19.50 UTC, we tried 20 meters and was unsuccessful but managed it on 40 meters. I was using 50 watts, a 102 ft G5RV, and the FT-767 with the Heil Goldline Mic. Hopefully Tomas will leave a comment containing his Station equipment used to make this QSO. We have just returned from a weeks Camping in the Scottish Highlands and had a fantastic time. The WX (weather) was good and we both managed to obtain a sun tan as well as a paddle in the lovely Arisaig Sea. We stayed at a lovely campsite over looking the Isle of Skye, Isle of Eigg, and the Isle of Muck, which is situated 6 miles south of Malaig and is called Portnadoran and is locally known as Portnalucaig. This fabulous location was very beautiful, we managed lots of touring, walking and quite a bit of ham radio. 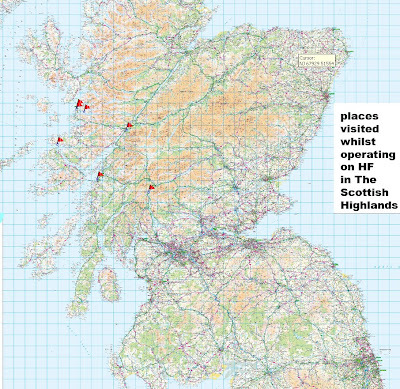 I got the opportunity to use the Call 2M for Scotland which caused quite a bit of pile up on a few occasions from some remote places in the North West Highlands operating 2M0HTS/M. Here is what happened during our stay, Thank you to all who managed to make the QSO it sure was fun! We can’t wait until we go back up there and do it all again! It was very beautiful and also an excellent radio operation location. I also worked a few other Stations that were not recorded and as you know it is difficult enough just getting the call signs correct whilst on the move in the mobile. A Big Thanks to Louise (M3TLL) most of you are mentioned above, Louise did a great job of managing the mobile operations and has a fantastic tolerance of radio. We covered almost 1000 miles during our travels, the return journey took 10 hours I was grateful of all the fantastic QSOs I made which kept me awake and alert for the complete journey arriving back in Baildon West Yorkshire safe and sound. Scotland is one of my favorite places, thanks to all of the locals for making our stay brilliant! 73 for now I am feeling recharged and ready to work some more stations.